You’ll be eagerly counting down days as we approach the holidays. This year, we are giving you even more to anticipate! Starting the week of 10/31 and going into the week of 11/7, we’re carrying unique advent calendars with surprises to open every day in December! Get ready, chocolate lovers! 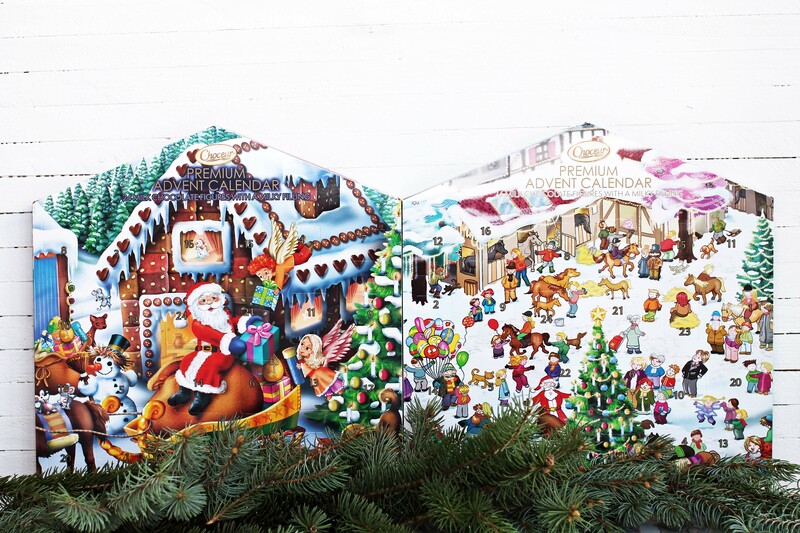 In stores beginning 10/31, choose between two Choecur advent calendars filled with milk chocolate figures. The chocolates inside the Premium Advent Calendar ($4.99) are crème filled and are larger in-size, whereas the Choceur Advent Calendar chocolates ($1.29) are solid. There are different scenes to select and kids can color the back! Both advent calendars use UTZ certified chocolate which means the cocoa came from a farm that followed UTZ sustainability standards. For more information on our various product certifications, read our Earth Day blog post. Satisfy your sweet tooth with these chocolate advent calendars. This will be the first ALDI cheese advent calendar released in the United States. This calendar will be in stores 11/7 at a price of $12.99. Enjoy 24 snack-sized European cheeses from the United Kingdom, Holland and Denmark in flavors of Cheddar, Gouda, Edam, Havarti and Red Leicester. There is a limit of three per customer so hurry into your store on 11/7 to grab this calendar…and the one below while you’re at it! This cheese advent calendar is as beautiful as it is delicious. Yes, you read that right. Our Wine Advent Calendar (price varies per Division) will hit stores the same day as the Cheese Advent Calendar. Pair them together for the best December ever. The wines in this calendar come from regions around the world, from South Africa to Australia, and are housed in 187 ml. individual bottles. Open one of the flaps each day to find a new variety. If you can’t decide what blend of wine you like best, this calendar carries an array of red, white, bubbly, sweet and dry. Similar to our Cheese Advent Calendar, this is the first time we’re selling this product in the United States. We’ll toast to that! Please note that we are limiting one per customer due to high demand. Taste a new wine every day in December with this limited-time calendar. Since our advent calendars are available for a limited time and are on a first-come, first-serve basis, we have product suggestions for a DIY version just in case. You have a few different options when it comes to making your own. One of the more eco-friendly choices is to purchase a homemade reusable advent calendar, such as a wooden one, that can be found at craft stores or at online retailers such as Etsy. This gives you the flexibility of using new goodies every year! If you are looking for a more involved craft project, you can make your own from start-to-finish. (A quick search on Pinterest will give you plenty of ideas). No matter how you decide to make your calendar, keep in mind that the storage of your calendar depends on the type of foods you use inside. This may limit the size and material of your calendar. For the chocolate and hard cheese, you will need to cut off a piece and wrap it in plastic wrap or aluminum foil to keep it fresh. As for wine, it will depend on the type of advent calendar you’re creating as to whether you’ll be able to use the full bottle of wine or will need to decant it. Use any of our award-winning cheeses, such as our Happy Farms Preferred Brie Cheese Round ($2.99) or Specially Selected Aged Reserve White Cheddar ($2.49). Purchase our seasonal limited-time Happy Farms Cheese Cubes ($1.99). These are already the perfect size and come in either mild Cheddar or Colby Jack. Another seasonal cheese we look forward to each year is our Happy Farms Preferred Cranberry White Cheddar ($2.99). It is sure to bring holiday cheer! Beginning 11/21, try our new Specially Selected Holiday Waxed Cheese Truckles that are in store for a limited time. Pick from Mature Cheddar, Wensleydale Cranberry, Cheddar with Onions and Double Gloucester & Chive ($2.49). You can’t go wrong with easy-to-cut classics like the Happy Farms Swiss Cheese or Sharp Cheddar blocks. (Price varies by region). Our Moser Roth Dark 70% Chocolate won the 2018 SELF Healthy Food Awards and is Fair Trade certified. If you want something flavored, Moser Roth also comes in Chili, Mint and Dark Sea Salt to name just a few varieties. (Price varies by region). It will be hard to decide which Choceur chocolate you want to include inside your calendar whether Mini Chocolate Bars ($2.29), Peanut Butter Cups ($2.69), Chocolate Covered Mini Pretzels (price varies by region) or Crème Filled Mini Bars ($2.29). If you want to include sweets with holiday flair, we suggest seasonal chocolates. Starting on 10/30, our German Winternacht chocolate becomes available. The Mini Santa, Bear and Snowmen ($0.74) would make adorable additions to the calendar. Our seasonal Baker’s Corner Vanilla and Chocolate Almond Bark ($2.69) come in slabs for baking, but can be divided into sampling sizes. Yes, we have more award winners! Our William Wright Chardonnay, 2016 vintage wine was awarded the World Wine Championship Award, earning a Silver Medal by the experts at the Beverage Testing Institute. You’ll want to taste our seasonal wines, (available beginning 10/30), before they are gone. If you want the authentic holiday experience, the Christkindl Mulled Wines or Gluhewin are your best bet. Our wine buyers have also selected some must-have wines for the season; click here for a Downloadable Wine Tasting Mat that features all eight of their recommended wines. Use this mat as a fun hosting activity and to help you plan perfect food pairings. *Wine advent calendar and wines are only sold in Divisions that carry alcohol. Prices range per Division. 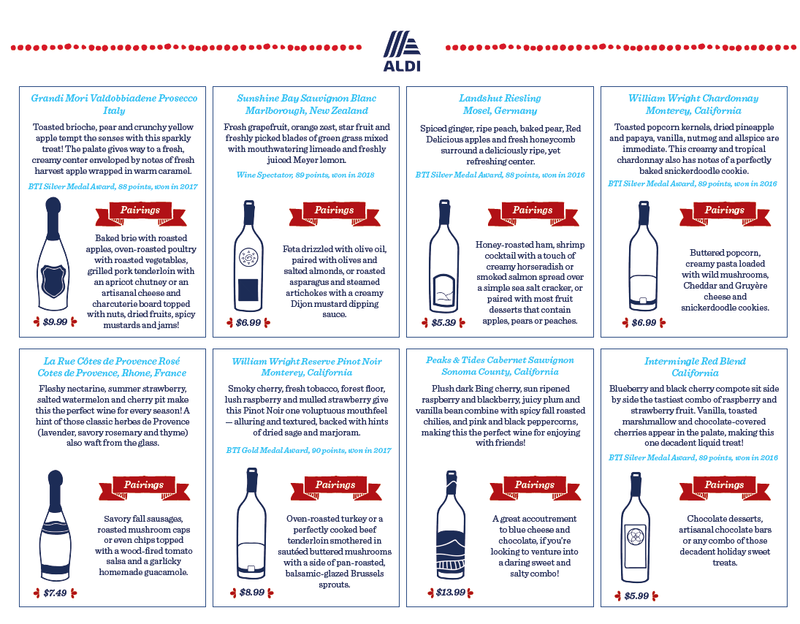 Download and print this Wine Tasting Mat to guide your wine selections. This holiday, have fun no matter how you count down until Christmas! Let us know in the comments below which of our advent calendars you’re most looking forward to buying! I live in Normal, IL and can’t see that any stores within an hour of me will offer the Wine Advent Calendar. I tried to check several stores. Is this true? My store sold out of all the advent calendars in a matter of minutes. Is the 11/7 shipment the only one? Hi, Miriam. Unfortunately it is the only shipment. The demand for this far exceeded our expectations. Was saddened by the reality behind the hype with your Wine Advent calendars – we got to the store twenty minutes early on a cold nasty Michigan morning and waited for the store to open only to learn that our store had received only 5 wine calendars so the rest of us were out of luck. After all of the promotional advertisement we expected better. Completely disappointed by the intentional under-supplying of the wine calendars. I live in a heavily populated area and the two stores near me got a “supply” of two and six products. I can’t imagine sales data from the UK release last year predicted that as a reasonable amount. So disappointed in this marketing ploy. You are the only grocery market anywhere that sells these for this price. People ran into the stores bought them up and now there are tons of them on Ebay for 150+. Next year make/sell more, and bring people into your store for other items! The cheese advent calendar was delayed and not delivered to the California stores on 11/7/18. It was supposed to be delivered 11/9/18 but it wasn’t in there either. I have tried to call to find out when it will be in – but there is no answer. Can you tell me when it should be delivered to California? Thank you! The store near me had a very small supply. I stopped in and they had long since sold out. I don’t know how many they received, but the workers seemed annoyed for having received so few. My neighbors and I were going to purchase wine and cheese calendars then open them up together. Whoever made the orders and so terribly underestimated should have someone else double check their numbers next year. A wine Advent calendar? In the midst of the holiday craze? Did you seen the look on women’s faces everywhere at the delicious, wonderful, novel idea of relaxing from the host madness to open the flavor of the night? Did you hear the collective gasps and cheers ring through the neighborhoods? Did you see the lines as gas stations the night before as moms everywhere gassed up their grocery getters in preparation? There was almost a mini black Friday feel to this. Advent calendars are no longer just for kids, folks. I went there in the early morning, but couldn’t find the wine advent calendar :(! Do they sell yarn? If so which store? 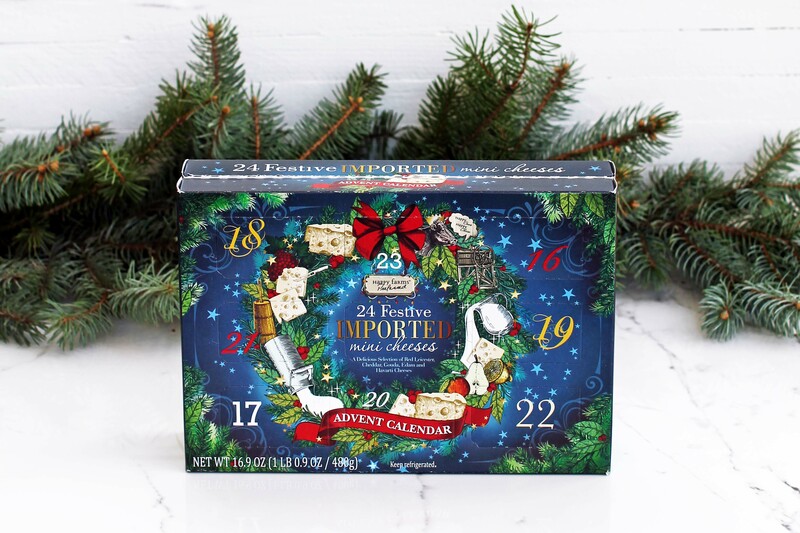 Is there any way to purchase the cheese or wine advent calendar online? Hi, Frederick. We unfortunately do not have any more of these available. Will all Aldi locations be open on Thanksgiving? Our stores will be closed on Thanksgiving. For those who were not able to purchase the cheese advent calandar due to location, stock, or other unspecified reason, you did not miss out. My opinion is premature yet passionate, in that I am very unsatisfied with the Happy Farms Preferred Cheese Advent Calandar thus far, as of Dec. 4 2018. Marketing has gotten the best of me, and I was expecting a flavored variety of the listed styles – Red Leicester, Cheddar, Gouda, Édam, and Havarti. Instead what I’ve excitedly, and conversely very disappointedly, opened as of today, was 4 of the same “matured Gouda” in a row. Lesson learned, I will certainly not be purchasing future “surprise” or “mystery” packages from ALDI again. In my personal opinion, you’d be much better off getting an 8 oz block of the Happy Farms Preferred Cranberry White Cheddar, Specially Selected Smoked Gouda, and the classic Specially Selected Edam. These specific cheeses with a wonderfully priced bottle of Winking Owl Shiraz (or 3) would be an investment garunteed to satisfy until after the holidays, unlike the Happy Farms Preferred Cheese Advent calendar that has lost its sparkle in less than 5 days. We’re sorry, Craig. If you’re not satisfied with the Advent calendar, you can bring the remaining product back to the store for a full refund. Same disappointment here! And my family was SO excited about this cheese a day idea… thinking there was something new/different each day to experience :o( We’ve opened nine (9) windows thus far – and have received two (2) Mature Gouda, (3) White Cheddar, and (4) Havarti. At first, I thought there must be something different about the second Havarti… dill or something… nope! Just more of the same -repeating, and repeating, and repeating. Aldi sells SO many varieties of cheese throughout the year, so I never would have dreamed that there are ONLY 4 to 5 different varieties total randomly placed in the daily slots. My 10 year old was quickly disappointed too – “This isn’t fun now.” Taking this back for a refund won’t do anything to replace the joy of killing/failing on this idea. Fun idea/good marketing… but POOR execution on the actual product. Ha ha ha, can I have Craig’s refund? We found out about the cheese calendar offering from a friend that received it and it has been quite fun watching him post the cheese of the day! Also entertaining has been going to all the stores to see if anyone has any of these items left as I think I’ve wrapped up my holiday shopping in the Aldis special sections. It is a learning lesson that I need to log in to the Aldi site more often to see what new offerings are available. Thanks for making the season entertaining, Aldis!!! Hello, I was one of the few people to get one of Aldi’s wine advent calendar items. 2/3 of the way thru the different wines I am very disappointed in the flavor of the wines most seem to be very bitter and dry. I am not sure if they are cheap wines or just bad choice of wines. I hope if they continue to offer these in the United States in the future they more discerning in the choice of wines put into the calendar. 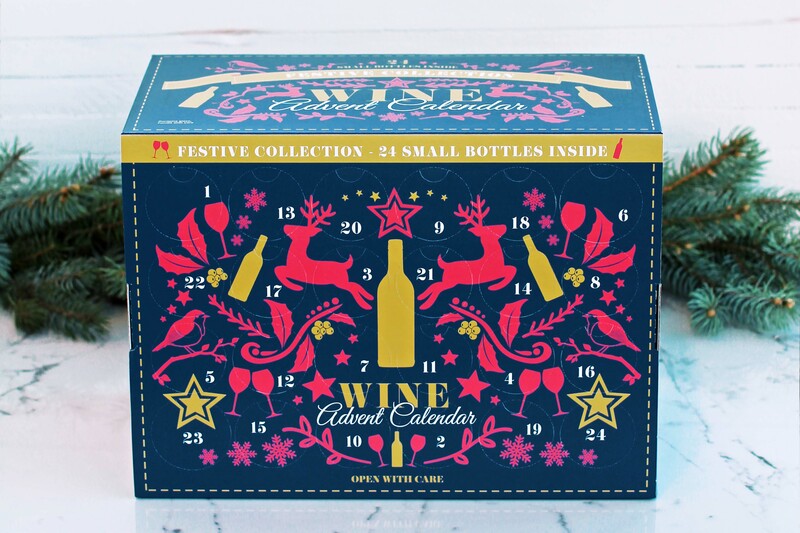 I love the idea of the wine advent calendar.